Impedance Spectroscopy is a powerful measurement method used in many application fields such as electrochemistry, material science, biology and medicine, semiconductor industry and sensors. Using the complex impedance at various frequencies increases the informational basis that can be gained during a measurement. It helps to separate different effects that contribute to a measurement and, together with advanced mathematical methods, non-accessible quantities can be calculated. 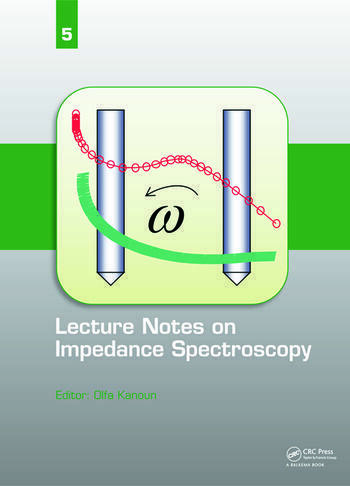 This book is the fifth in the series Lecture Notes on Impedance Spectroscopy (LNIS). The series covers new advances in the field of impedance spectroscopy including fundamentals, methods and applications. It releases scientific contributions as extended chapters including detailed information about recent scientific research results. This book is including proceedings of the International Workshop on Impedance Spectroscopy (IWIS) which has been launched already in June 2008 with the aim to serve as a platform for specialists in this field. Since 2009 it became an international workshop gaining increasingly more acceptance in both scientific and industrial fields. It is organized regularly one time per year. This book is interesting for graduated students, engineers, researchers and specialists dealing with impedance spectroscopy. It includes fundamentals of impedance spectroscopy as well as specific aspects form manifold applications in various fields. Can Impedance Spectroscopy serve in an embedded multi-sensor system to improve driver drowsiness detection? Prof. Olfa Kanoun received her Dipl.-Ing. Degree in 1995 from the Technische Universität München and her Ph.D. degree in 2001 from the Universität der Bundeswehr München in Germany. She was awarded from the Commission of Professors in Measurement Technology (AHMT) in Germany for the best dissertation in 2001. In 2004 she founded the IEEE Instrumentation and Measurement Chapter within the IEEE Section Germany. Since 2007 she is professor at Chemnitz University of Technology in Germany leading the chair for Measurement and Sensor Technology (MST). In 2008 she founded the International Workshop on Impedance Spectroscopy (IWIS). Her main research fields are: Impedance spectroscopy, sensors, measurement systems and energy harvesting.